New sax plugs by EGR. 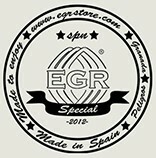 Designed and made 100% in Spain by EGR. New EGR Barrle made with Cocobolo wood. K-26 Prestige Series Gold Plated There is 1 product. Ligatures made per order, we will ship it in 2-3 weeks.